This is one of the traditional Chinese symbols for good meanings. 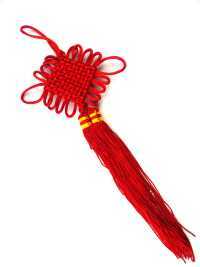 The main body of the knot is made of one single string, the shape of this particular red knot symbolizes love, family and harmony. It is an excellent object to be hung on the east side wall of the family room or office.